Some months ago The Commune published on its website a short review of our pamphlet “Class Consciousness and Revolutionary Organisation”. We welcome such reviews, however critical. There are too few real debates and discussions amongst revolutionaries today and we would like to see and participate in more. However the Commune review is hardly much of a contribution in this respect as it is full of criticisms of positions we do not hold. Just to put matters in context, we have had a rather odd relationship with The Commune since it first emerged from a split from the Trotskyist AWL 5 years ago with the promising call for “revolution from below”. We had a number of interesting debates with them over organisation, trades unions, nationalism and national liberation struggles early on. We also attended Commune meetings in London where we had some positive exchanges with various comrades. Thus in July 2013 when the organisers of the Sheffield Anarchist Bookfair asked us if we would share our already booked meeting on “Marxism and Anarchism” with The Commune we had no trouble agreeing to it. The Commune (in the person of Barry Biddulph himself) were less happy but were forced to accept it by the organisers. We then discussed between ourselves how we would approach the meeting. We found we agreed on many basic points (about the Marxist interpretation of the state for example) and decided to hold a joint introduction. The meeting was well attended and the discussion was broad ranging and serious on all sides from Marxist to anarchist. However in the Commune’s report on that meeting you will not find any reference to the fact that the CWO were there, let alone supplying the moderator and on the platform of speakers! The Commune has also recently taken two texts from our site on the death of Mandela and the ANC and re-published them with no acknowledgement of their provenance. Some people (not known by us) who posted on their site expressed annoyance that this was not made clear. We cannot understand this narrow-minded attitude towards us but it certainly also comes out in the review of our pamphlet. Our original intention was to have made this reply directly to the review on The Commune’s site but we found that it was “closed to comments”. However we had a foretaste of Barry Biddulph’s argument in the joint meeting of the Midlands Discussion Group and the Free Communist last July. Despite the fact that it was not our meeting he seemed to think that the main purpose of the meeting was to discuss the views in our pamphlet which he began by immediately equating with those of Lenin in What is to be Done. When we asked him to read further on in the pamphlet he then retreated a step but the same accusation is repeated in slightly modified form in the review on the Commune website. According to Barry we are both “abstract” and “mechanical materialist”, we are “substitutionist” but reject “the notion of a workers’ state” and argue that “workers power can only be rooted in the mass organisations thrown up in struggle against the state”. In short what we have in this review is a failure to understand the real sense of our argument and the review becomes a bit of a rant. This comes out most neatly in the conclusion when Barry concludes that the pamphlet is so inconsistent it must have been written by several comrades. All this reveals is that Barry is an ex-Leninist (of the Trotskyist variety) for whom the god has failed so now everything Lenin said is reactionary. We in the communist left today don’t base our politics on Lenin, either as saint or sinner but do take up those arguments which he makes that are valid. In the Midlands Discussion Forum/Free Communist Meeting most participants identified themselves with the “communist left” but Barry only replied that there “could be worse things to be called”. The review makes it clear that he has no idea of what communist left positions are and his failure to acquaint himself with our basic ideas makes the review all the weaker. Communists attempt to facilitate the development of the working class into a self-conscious subject striving to forge an alternative to capitalism. The communist organisation is an organic part of the ongoing process of struggle. The working class become conscious of its aims and fights for them. Communist organisation is not joined or linked to the working class: it is the working class’s own movement. Communism comes from within the working class movement, not from the outside. The idea of communism was not invented by Marx. Nowhere in the pamphlet does it say that the idea of communism was invented by Marx and the chapter on Lenin was intended to show that he was wrong to accept Kautsky’s (and we might have added Plekhanov’s) view that social democratic (or communist) consciousness can only be brought to the working classes from outside by the educated representatives of bourgeois origin. … the passive reflection of the lessons of the previous revolutions. They partially agree with Lenin’s WITBD agreeing that the working class cannot formulate an independent ideology, claiming that what Lenin really meant by outside was outside the physical boundaries of the daily class struggle. We also do not deny that there are moments of sudden outbursts of class activity and resistance which transcend and surprise all those who have participated in previous struggles. Such spontaneity has been part of the class struggle since the dawn of capitalism. But precisely because it is spontaneous there is not much more to be said about it. The “old mole of revolution” will always surface at moments which surprise even those who have waited all their lives for it. We though are not into speculation but have to concentrate on those aspects of the class struggle which are susceptible to analysis. We did not choose the title of our pamphlet by accident. We did not want a vacuous philosophical discussion about what is class consciousness in isolation from the “real movement” but analysed it in terms of the historical acquisitions and (let it be said) past failures of the working class. Which brings us to the thorny issue of the October Revolution. Barry does not understand the communist left analysis of the Russian Revolution which is neither the all-embracing “Lenin and Trotsky could do no wrong” of his old pals in Trotskyism nor is it the ahistorical denunciation of the worst of the anarchists. 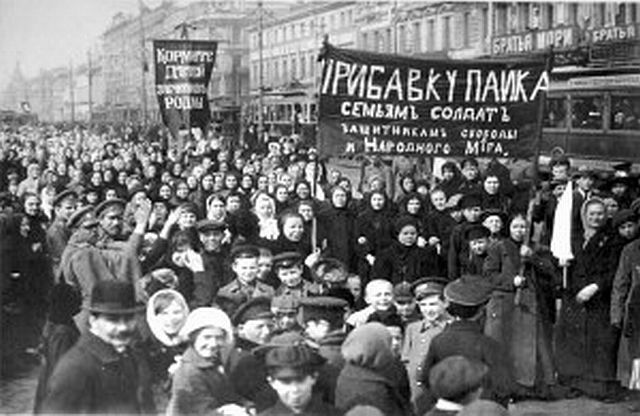 For us the October Revolution was proletarian in 1917. It was not the work of a small minority but overwhelmingly supported in the soviets (80% of the delegates to the Second Soviet Congress were supporters of the Bolsheviks). The Bolsheviks (the only party calling for “all power to the soviets” had been the majority party in both Moscow and Petrograd for at least 6 weeks. More thoughtful anarchists like Paul Avrich point to the adoption of the April Theses in 1917 as the main reason why many anarchists in 1917 saw the Bolsheviks as a break with the parliamentary cretinism of Social democracy and offering real revolution. And that is the point. The Bolsheviks were as we said “the best of the Social democrats” but they had not broken sufficiently with the Social Democratic framework which they came from. They thus followed the Mensheviks and the Social Revolutionaries in creating a cabinet of ministers (disguised as revolutionary by adopting Trotsky’s suggestion of “People’s commissars”). Sovnarkom (the Council of People’s Commissars) was imposed on top of the soviet structure rather than making the Vtsek (Executive Committtee elected by the All-Russian Congress of Soviets) the responsible body. However, this and many other Bolshevik errors, did not cause the counter-revolution (the “why”). This was due to the fact that the revolution was confined to one very weak link in the capitalist chain. What this explains is the “how” of the defeat and even this was not pre-ordained in anything the Bolsheviks thought. The Bolsheviks were responding to circumstance and were flying by the seat of their pants in dealing with all the problems that the civil war threw up. The Left Communists of 1918 were also Bolsheviks but they were the first to raise the spectre of the emergence of state capitalism (which Lenin dismissed by insisting that state capitalism was a step towards socialism). Radek, who at the time (1918) was a left communist (before later becoming a National Bolshevik and later again a supporter of Trotsky) actually warned that the worse thing that could happen would be for the Bolsheviks to win a military victory but lose the fight for socialism. This was precisely what they did by setting up the party-state in a process which went from 1918-21. Our pamphlet actually says the October Revolution was a lesson for the working class not a model to be followed today. This is presumably the contradiction which the review does not explain but cannot understand. But then the beauty of a review is you ask questions and don’t have to give answers. It is currently fashionable to denounce the need for revolutionary organisations, programmes and ideologies (as it was in the late 60s) but the notion that “the movement is everything” has always ended up by recognising that the goal is nothing. This is a great consolation for the capitalist class. In looking at class consciousness Barry fails to face up to the nature of the proletariat as a class. The bourgeoisie did not have to agonise over the issue. Why? Because they were a propertied class. For them class instinct melded into class awareness and into class consciousness. When they intoned universal rights they meant the right to free trade, free movement of goods, minimal taxation of trade. The slogan of liberty so beguiling for all classes though was simply to win freedom for those who could afford it. They thought they had discovered the ideal system for humanity and considered it to be the acme of history. All the bourgeoisie had to do was fight for a legal framework to defend their property interests, destroying feudal restrictions en route and the rest followed. The review is right in that Marx did not invent communism. He said himself he did not invent class struggle either. What he did was point out that capitalism for all its advances on feudalism was not the end of history and that the last exploited class would be the bearers of a new and still higher mode of production. However having no property to defend how does proletarian class struggle develop into communism? First, by resistance to the everyday encroachments of capital and, from this, developing a critique of the whole system. This can only happen historically as we learn more about the traps which beset us on the way. Our consciousness is expressed in our ideas and our ideas can only take powerful material form when they are expressed in organisations (class wide and minority). Our pamphlet attempts to show how the working class has acquired a historically discovered method to reach a stateless and classless society in the form of class wide organisations like soviets based on the principle delegation. It also argues that the fight for these discoveries, at least initially, has to be conducted by those in the class who first recognise the bankruptcy of capitalism. The more united and organised we are in both senses the less painful will be the birthpangs of a new society. We naturally welcome further debate on this most important issue for the proletariat today but we hope in future that it will be from a more careful reading of what we say. 1 See the_Commune_.co.uk. Although their review was entitled “Class Consciousness and Communist Organisation”. The Commune also did a review of our pamphlet on Trotsky, Trotskyism, Trotskyists but it was more their own reflections on the issue rather than a review of our critique. 4 The Free Communist recorded the meeting and it can be heard on youtube via their site. 7 The pamphlet, like all our work, is a contribution to an ongoing debate. We now recognise that we should have tackled those who argue like the “communisateurs” that the movement will somehow take us to communism without us knowing about it and we are also aware, as our Greek, German and Canadian comrades have pointed out as they translate it, that the pamphlet contains a number of errors (but not seen by this review). Once we have sorted these out a new version will be prepared. And there was an error here too which will be found in the printed version. On the third line of the last paragraph above we wrote "exploiting" instead of "exploited". As no one has written pointing this out we can only assume our readers are of such a high level of class consciousness that they make the correction instinctively!